When you use RFC1483 bridging, Ethernet frames bridge over the ATM virtual circuit. This circuit connects the router to the Internet Service Provider (ISP). The router operates in Bridge Mode, and only passes Ethernet packets between the ISP and local network. The ISP may choose to statically or dynamically assign IP addresses to local network nodes. If the ISP employs dynamic assignment, a DHCP server in the ISPs network assigns addresses. 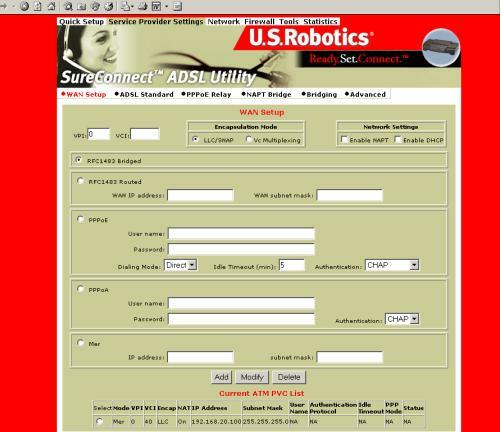 Open the SureConnect Web User Interface (WUI). This example employs the Web User Interface. You can set up the Network Model with any of the router's three interfaces. The other two interfaces are the Terminal User Interface (TUI) and the Command-Line Interface (CLI). In any case, succeeding steps are similar. Click the Service Provider Settings tab. This tab is on the top of the screen. The Service Provider Settings Window opens. Click ADSL Standard. The ADSL Standard Window opens. Select the ADSL protocol that youll use. For most users, Multi Mode is the right choice. Click WAN Setup. The WAN Setup Window opens. Below the Add button, notice the Current ATM PVC List. On this list, select any PVC that you dont need. Enter VPI and VCI values. Select your desired encapsulation mode. Your choices are: LLC/SNAP and VC Multiplexing. At Network Settings, be sure that Enable NAPT and Enable DHCP remain unselected. Click the Tools tab at the top of the window. 1. Open the SureConnect Web User Interface (WUI). 6. See the Current ATM PVC List at the bottom of the screen (Figure 3). On this list, verify your VPI and VCI settings. When you use MAC Encapsulated Routing (MER), Ethernet frames bridge over the ATM Virtual Circuit. The router can still perform IP routing with Network Address Translation (NAT) for the LAN. To perform this NAT function, the router requires a static IP address for its MER interface. Your ISP must supply the address. The router also supports dynamic assignment of IP addresses to local network nodes. 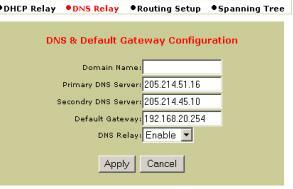 When using dynamic assignment, the router acts as a DHCP server. 4. 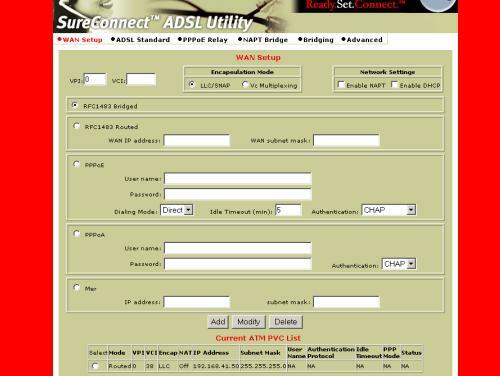 Select the ADSL protocol that youll use. For most users, Multi Mode is the right choice. At Network Settings, enable NAPT and DHCP by selecting the appropriate boxes. In the MER box, enter the static IP address and mask that your ISP supplied. 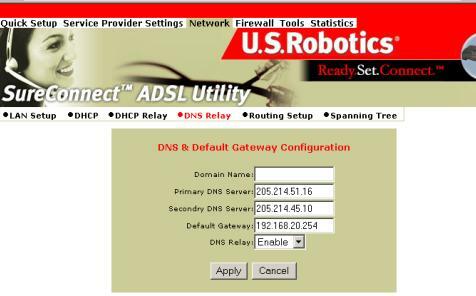 At the DNS Relay line, select Disable from the dropdown menu.. Enter the Primary DNS Server IP address that your ISP provided. Enter the Default Gateway IP address that your ISP provided. 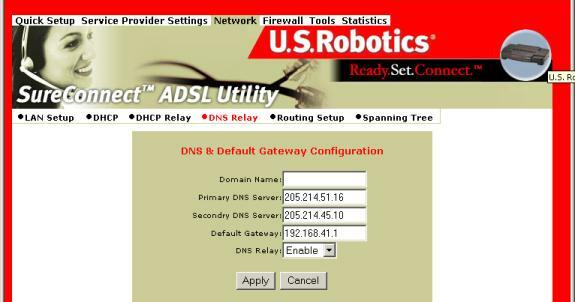 On the DNS Relay line, select Enable from the dropdown menu. 6. See the Current ATM PVC List at the bottom of the screen (Figure 3). On this list, verify your settings for VPI and VCI. 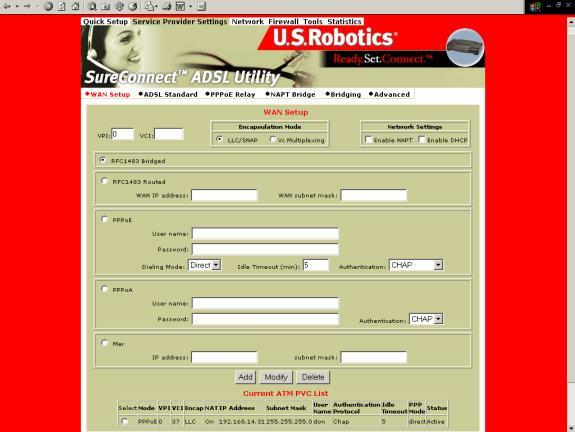 � Allows ISPs to provide billing and access control similar to what dial up systems offer. � Provides session authentication using either Password Authentication Protocol (PAP) or Challenge Handshake Authentication Protocol (CHAP). 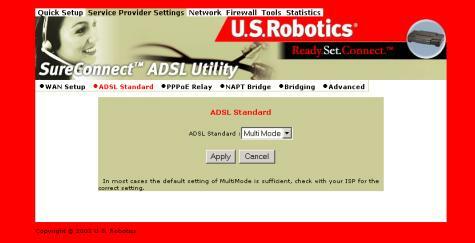 � Permits router signals to easily negotiate link and network parameters between the router and ISP. With PPPoA, the router achieves IP routing with Network Address Translation (NAT) for the LAN. The PPPoA-enabled router also supports dynamic IP address assignment to local network nodes. With dynamic assignment, the router acts as a DHCP server. 1. 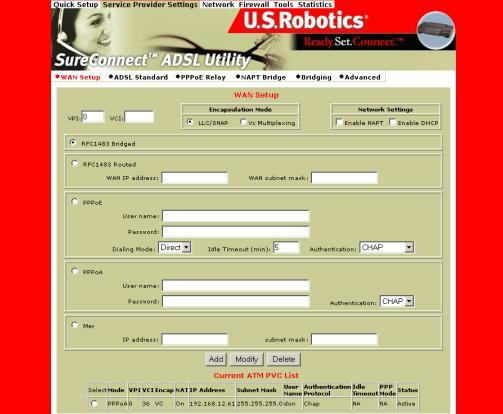 Open the SureConnect Web User Interface (WUI). This example employs the Web User Interface. You can set up the Network Model with any of the router's three interfaces. The other two interfaces are the Terminal User Interface (TUI) and the Command-Line Interface (CLI). In any case, succeeding steps are similar. 2. Click ADSL Standard. The ADSL Standard Window opens. 3. 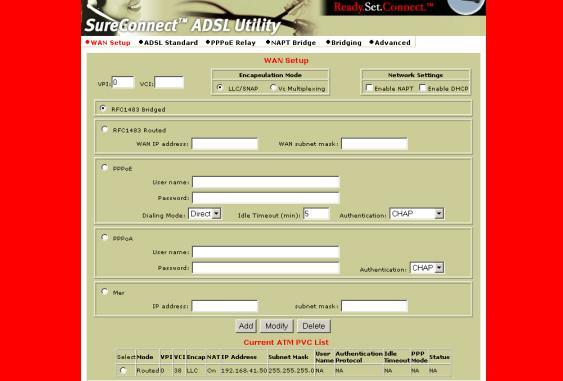 Select the ADSL protocol that youll use. For most users, Multi Mode is the right choice. In the PPPoA box, enter your ISP-assigned username. In the PPPoA box, enter your ISP-assigned password. In the PPPoA box, enter the authentication protocol that your ISP uses. 5. Click the WAN Setup. 11. See the Current ATM PVC List (Figure 3). Verify the authentication protocol that your ISP uses. This protocol must appear on the list. 12. Click the Network tab at the top of the window. rovides session authentication using either Password Authentication Protocol (PAP) or Challenge Handshake Authentication Protocol (CHAP). With PPPoE, the router achieves IP routing with Network Address Translation (NAT) for the LAN. The PPPoE-enabled router also supports dynamic IP address assignment to local network nodes. With dynamic assignment, the router acts as a DHCP server. Click the radio button for your desired encapsulation mode. Your choices are: LLC/SNAP and VC Multiplexing. At Network Settings, enable NAPT and DHCP by checking appropriate boxes. In the PPPoE box, enter your ISP-assigned username. In the PPPoE box, enter your ISP-assigned password. In the PPPoE box, use the arrow to select the dialing mode. For most users, Direct is the right choice. In the PPPoE box, enter the Idle Timeout value. Idle Timeout determines how long the link remains active during a period without data transfer. Idle Timeout only affects Auto Dialing Mode. The router doesnt use Idle Timeout for direct dialing mode. In the PPPoE box, use the arrow to select the authentication protocol that your ISP uses. 7. See the Current ATM PVC List at the bottom of the screen (Figure 3). On this list, verify your settings for VPI and VCI. 14. Click the Network tab at the top of the window. At Network Settings, be sure that NAPT and DHCP dont have a checkmark. In the RFC1483 Routed box, enter the static IP address and mask that your ISP supplied. Click the Network tab at the top of the window. Click LAN Setup. The LAN Setup Window opens. 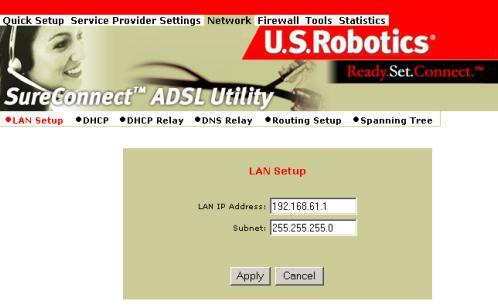 This step changes the LAN IP address that connects to the routers Web user interface. In the LAN IP Address box, enter the new Ethernet 1 local LAN IP address. This step changes the network subnet that connects to the routers Web user interface. In the Subnet box, enter the new Ethernet 1 local Subnet mask. This step locks in your LAN IP address and network subnet changes from the previous steps. Click Apply. This action saves your current configuration and restarts the router. If you dont know how to complete this step, refer to your PCs manual. Most Windows PCs allow access to network settings though the Start Menu at Settings. Look for a listing such as Network and Dial-Up Connections. Also refer to the Quick Installation Guide. Open the SureConnect Web User Interface (WUI). 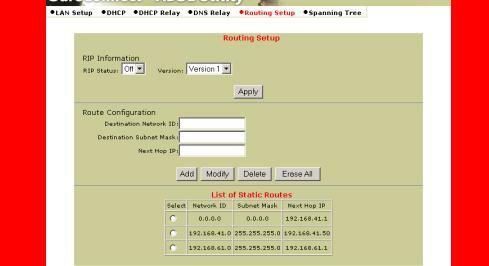 Click Routing Setup. The Routing Setup Window opens. 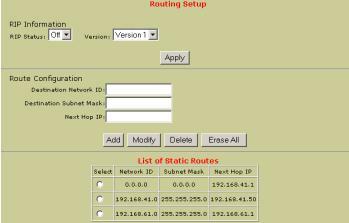 � Destination Subnet Mask: 0.0.0.0. Enter 0.0.0.0 into the Destination Network ID box. Enter 0.0.0.0 into the Destination Subnet Mask box. At the Next Hop IP box, enter the WAN Default Gateway supplied by your ISP. 10. Click the Network tab at the top of the window. 14. Click the Routing Setup tab at the top of the window. At Network Settings, check NAPT. At Network Settings, check DHCP. Click DNS Relay. 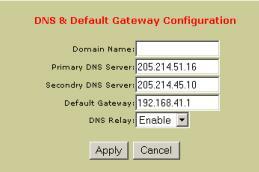 The DNS & Default Gateway Configuration Window opens. At the DNS Relay box, select Disable from the dropdown menu. At the DNS Relay box, select Enable from the dropdown menu. 1 . Open the SureConnect Web User Interface (WUI). 7. See the Current ATM PVC List at the bottom of the screen (Figure 3). On this list, verify your VPI and VCI settings. 17. Click the Network tab at the top of the window.